Until the Lioness tells her story, the hunter will forever be glorified! A woman’s expression of the Divine is no less worthy of being told then the lineage of men that has been so well preserved throughout the ages. Everywhere I read, “little is known about this queen or that goddess,” So let me gather the facts. We have given our spirit to be guided by men, pious or perverted, far too long creating the imbalance of life we experience today. I believe there were many profound Women Warriors, performers of miraculous feats, now and throughout the ages whose stories go unheard or barely whispered. To balance life in accordance with the universal laws, “Her” story must become one with “His” story. Queen Hatshepsut, ruled Egypt or 20 years in the 15th century B.C., dressing like a man and wearing a false beard. A monumental builder, she wielded more power than the most well-known ancient Egyptian women rulers, Cleopatra and Nefertiti, who unlike her never took the title of pharaoh. Her two-decade rule was the longest among ancient Egyptian queens, at a time of the New Kingdom’s “golden age.” She is said to have amassed enormous wealth, channeling it into building projects, and launched military campaigns as far away as the Euphrates River in present-day Iraq, and Nubia in what is now Sudan. 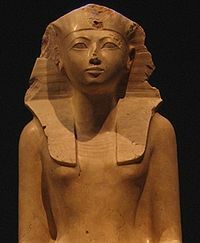 In all, Hatshepsut accomplished what no woman had before her. She ruled the most powerful, advanced civilization in the world, successfully, for her entire reign. Even if there were some who resented her success, her success stands for all eternity. She was one of the most prolific builders among the pharaohs, commissioning thousands of construction projects throughout both Upper and Lower Egypt. Almost every major museum in the world has a collection of Hatshepsut statuary. Hatshepsut’s most famous accomplishment is her funerary temple in ancient Thebes, on the west bank of the Nile in today’s Luxor. The colonnaded sandstone temple was built to serve as tribute to her power. Surrounding it are the Valley of Kings and the Valley of the Queens, the burial places of Egypt’s pharaohs and their wives. As a favorite daughter of a popular pharaoh, and as a charismatic and beautiful lady in her own right, she was able to command enough of a following to actually take control as pharaoh. She ruling until her death in 1458 BC, and left behind more monuments and works of art than any Egyptian queen to come. To quell the fears of her people, she became a “king” in all statuary and relief during her reign. She even dressed in the traditional garb of male rulers: the shendyt kilt, the nemes headdress with its uraeus and khat headcloth, and the false beard. Hatshepsut was a master politician, and an elegant stateswoman with enough charisma to keep control of an entire country for twenty years. In a final bid to be recognized as a legitimate queen, constructed a fabulous temple in the Valley of the Kings, of all places, by a tall plateau at Deir-el-Bahri, across the Nile from Thebes. Co-Director of the International Association of Sufism (IAS), the Executive Editor ofthe quarterly journal, Sufism: An Inquiry, and founder of the International Sufi Women Organization, Seyyedeh Dr. Angha is the main representative of the IAS to the United Nations (NGO/DPI) and the first Muslim woman inducted to the Marin Women’s Hall of Fame. Seyyed Dr. Angha, the daughter of Moulana Shah Maghsoud, the twentieth century Persian Sufi of the Uwaiysi School of Sufism, was the first women appointed to teach in her father’s school. She was also the first women to sit at the center circle with Muslim leaders from around the world to lead meditation at the international Sufism Symposium. An internationally published author, featured in media and publications including White Fire: A Portrait of Women Spiritual Leaders in America and Women in Sufism: A Hidden Treasure, she is one of the major Muslim scholars of the present time with over fourteen published works. Her dedication to peace has led her to serve in various leadership roles in large-scale international interfaith organizations. Dr. Angha has given lectures and taught classes nationally as well as internationally. “Sufism: Literature and Poetry” at the Smithsonian Institute, Washington, D. C.